From June through to October, Humpack whales migrate North from their summer Antarctic grounds to winter in the South Pacific. 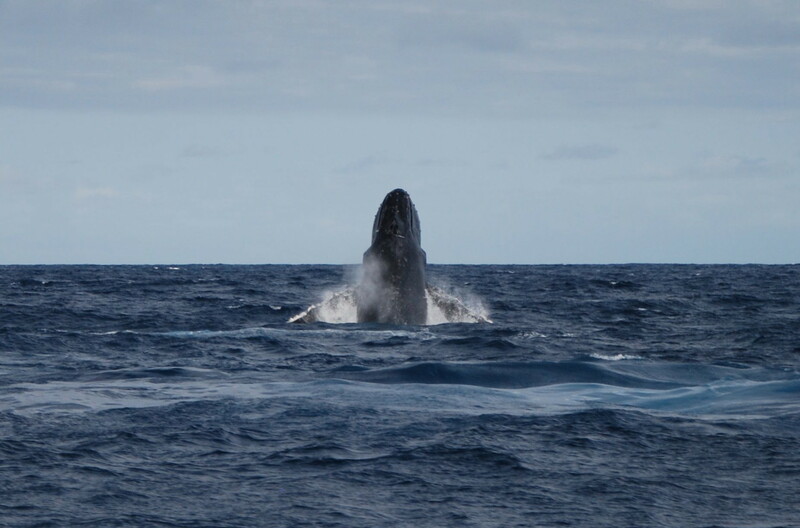 Many Humpacks head for the waters around Tonga though a distinct population heads for Fiji to breed and calf. These humpback whales are frequently seen in the waters around Kadavu island.Later in the season we often get a mother and calf enter the island’s lagoons and it is possible to whale-watch and sometimes snorkel with these magnificent giants of the Pacific Ocean. On most days, our guest transfer boat runs between the resort and Kadavu airport and usually sights any whales resting or playing inside the Great Astrolabe barrier reef . 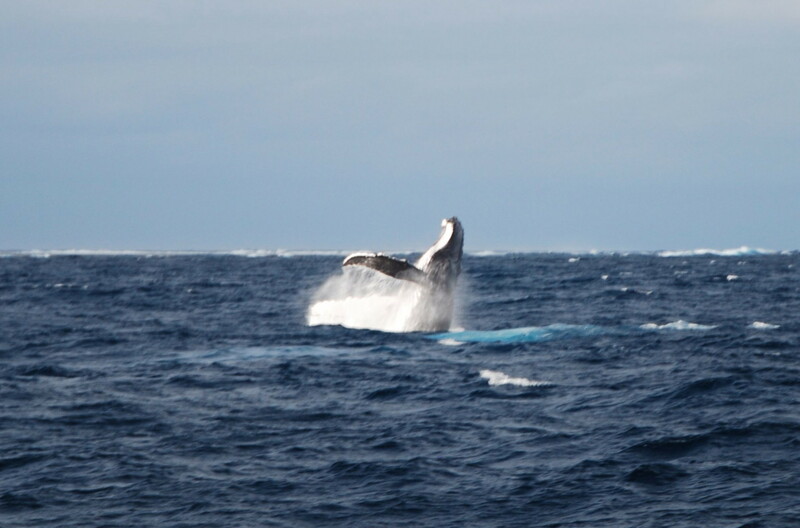 Our dive boats and gamefishing vessels are also out each day so our guests are well informed of any whales in the area. To sit quietly alongside these awesome huge creatures is an incredible experience, particularly when they are in a playful mood. When we have a humpback nearby, we run a snorkel boat out and encourage all our guests go along and see the whales for themselves. Its an unforgettable experience. Large pods of up to 50 pilot whales are common in Fiji waters and are often sighted from the resort’s gamefishing vessel ‘Bite Me Too ‘. Usually seen cruising along the outer barrier reef slopes, they sometimes spend time on the sheltered lee side of the reef to rest and feed where it is then possible to snorkel with them. Frequently see from all the resort’s boats are pods of spinner dolphin. These guys just love to ride the boat’s bow wave and always come charging over whenever you pass them by. It is easy to sit just inches away from them as they effortlessly porpoise in front of the boat but stick a mask on and jump in and they vanish into thin air (or water I should say). One of their favourite games it to surf in the barrier reef passageway surf breaks. Called spinner dolphin for their frequent playful spinning jumps, their underwater whistling and clicking are often heard by our divers but they are a rare sight on SCUBA. Our big gamefishing vessel ‘Bite Me Too‘ is available for whale watching charters should guests wish to range further afield in comfort, searching for and following whales and dolphins.